Hard Pressed Extruded Anodized Aluminum Alloy 6061/T6. Structure hard pressed extruded anodized aluminum alloy 6061/T6. 1 . Base (footing ): Hot dip galvanized steel parts. They are used for connecting the tent with ground . On concrete floor , use expansion screws to fix the bases with floor . On soft ground ( grass ground, mud ground etc) , use big steel nails ( anchor ) to fix the bases with ground . On undistructible ground ( marble , asphalt ground etc ) , use weight plate system to fix the bases with ground . 2 . Main structure: hard pressed extruded anodized aluminum alloy 6061/T6. different clear span width tent, profile size are different. Color is anodized silver, there is other color for optional. 4 . Roof fabric covering ; 850g / sqm double PVC coated polyster fabric. 5 . Side wall: aluminum frame tempered glass wall. 6 . Installation ;the tent can be fixed with ground through bases by different ways . If concrete floor , the tent can be fixed by expension screws . If soft ground ( grass ground , mud ground etc ) , the tent can be fixed by big steel nails ( anchor ) . If undestructible ground ( marble , asphalt etc ) , the tent can be fixed by weight plate system . We can send one technician to guide the installation FOR FREE , but the buyer needs to cover the cost of visa , round trip air tickets , accommodation , food and other cost that happen in your country . Wedding party ; we can design the tent into many style & size according to the wedding party theme . To make the tent suite different style wedding , different types of party and make the party full of happy atmosphere . 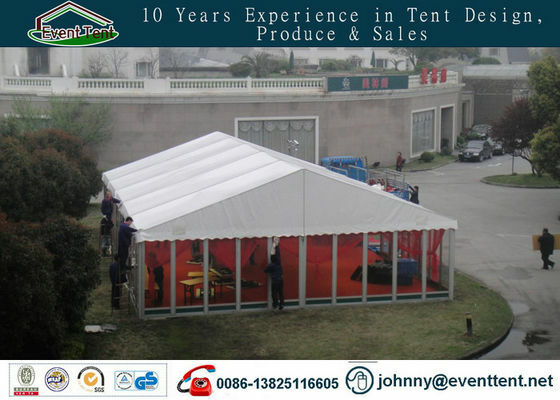 Trade show ; as the tent has no posts inside , can make use of 100 % space , can set many trade booths inside the tent . Gymnasium; the tent can be used as gymnasium . the space is big and no posts inside , can make use of 100 % space . Short delivery time: we can finish the production within 15 to 30 days no matter how big the size you required. Good quality: all the material we use to make the tents are good quality with certificates and SGS testing reports. We never use cheap material. Good production: we have professional equipment to produce the tent, such as digital control frame production machine, high frequency fabric welding machine. 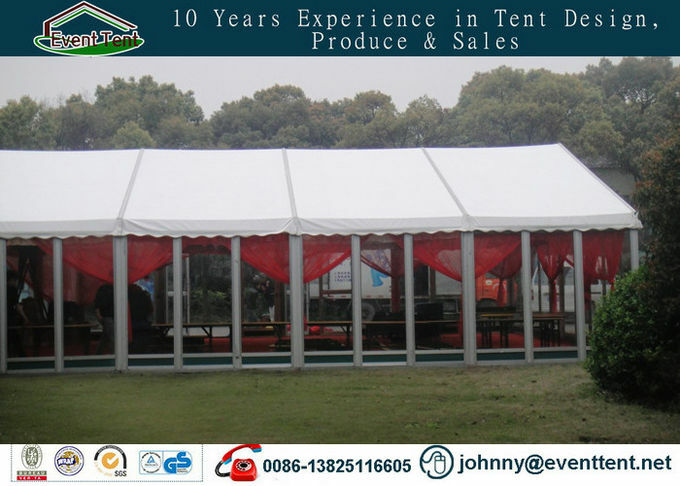 With the professional equipment, the tents will be finished in high quality. Is your tent strong and stable enough? How about the wind load? Yes.The main frameworks (upright support and roof beam) are manufactured with high impact extruded anodized aluminum (6061/T6). So our tent structure is safe and strong and can resist wind speed up to 120 km/h. Our tents can be assembled and dismantled repeatedly. The lifespan of aluminum framework can reach to 15-20 years, and 5-8 years for PVC fabrics depending on different conditions of usage. Guarantee one year. During the warranty period, we shall repair or replace the damaged part accordingly because of any damage due to quality problem. Not including man-made damage, accident damage or force majeure.